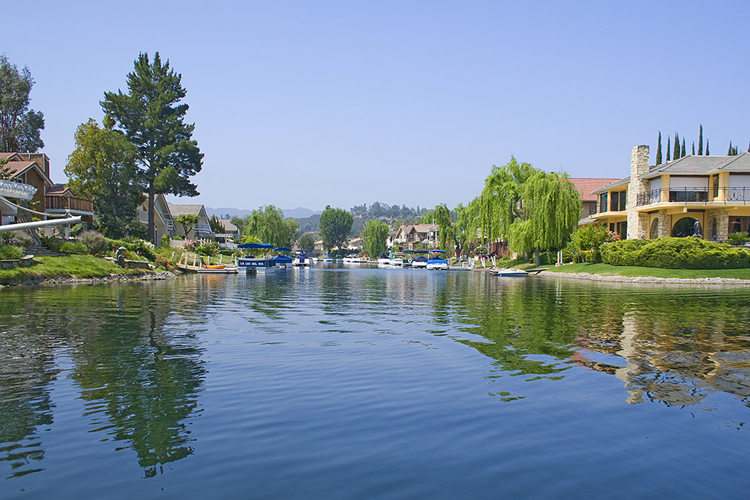 Westlake Village is a planned community that straddles the Los Angeles and Ventura county line. The eastern portion is the incorporated city of Westlake Village, located on the western edge of Los Angeles County, California. The city, located in the region known as the Conejo Valley, encompasses half of the area surrounding Westlake Lake, and small neighborhoods primarily south of U.S. Route 101and east of La Venta Drive. Much of Westlake Village is surrounded by open space, including hiking and horse trails, as well as the vast Santa Monica Mountains National Recreation Area. The town is in the northwestern Santa Monica Mountainsarea, and is 9 miles (14 km) inland from the Pacific Ocean. The lake lies within the watershed of Malibu Creek. Water from the lake must be released into the creek in compliance with an agreement between the California State Water Resources Control Boardand the Westlake Lake Management Association, a private entity that oversees the operation of the lake. Over one half of the original “Westlake” development lies west across the county line, wholly within the city limits of Thousand Oaks. This boundary, which divides the Incorporated City of Westlake Village, and Thousand Oaks portion of Westlake Village, crosses over the Westlake Golf Course, halfway between Lakeview Canyon and Lindero Canyon roads, and half of the Lake itself. The local area is home to top rated schools which is a huge draw to the area as well as home to top employers including Bank of America, Dole Foods and Move Inc. The vast array of neighborhoods range from estate properties, planned developments of residential homes to townhome developments. Some of the developments include lake access properties, retirement community lifestyle and many communities that appeal to most any lifestyle. There is truly something for everyone to afford and enjoy.